Like you, I receive a lot of spam … fortunately Google’s g-mail picks most of it up and automatically dumps it into the ‘trash’ folder for me. The problem is, this kind of spam receives no attention, because it takes more than it gives: “give me your credit card number and I will give you some purple tablets” [AJC: either that, or steal your money … spam ‘n scam!]. Only 43% of consumers will cut back on holiday spending this year, compared to 55% in 2008, according to a Consumer Federation of America survey. While increased consumer optimism spells good news for retailers, for Americans planning to “stretch” the budget, the New Year could bring falling credit scores, and with it, serious consequences. 1. Be Smart with Credit. Using a credit card is ok – experts agree having 3-5 credit cards helps your credit, if used responsibly. But carrying a balance on your credit card leaves you (1) stuck paying interest that could cost you, in some cases, double or triple the cost of those gifts in the long run and (2) with a much lower credit score, which could jack up interest rates on your credit cards and jeopardize your chance of getting lines of credit elsewhere (buying a house, a car, etc.). Services like FICO Score Watch combat this by providing emails or texts alerting you to any changes in your FICO score (either positive or negative), and notifying you when you’ve qualified for a better interest rate. A credit score increase of 30 points will save the average consumer $105 per year. For more information on FICO Score Watch, go to: www.myfico.com/Products/ScoreWatch/Description.aspx. 2. Resist “Short Savings.” The salesperson at your favorite department store offers you an instant 20% savings just for opening up a credit card in their name. While that $20 seems tempting at the time, it can quickly put you in debt if you’re not careful. The temptation of the deal is also one reason why the average consumer has a total of 13 credit cards. Opening new lines of credit can also hurt your credit score, so make sure the card meets your overall needs and not just your desire for quick savings. 3. Don’t Wait Till April! Many holiday shoppers use their Tax refund to pay off credit card balances left over from the holidays, which can be incredibly expensive, not to mention detrimental to your credit standing. A credit card balance of $500 dollars from January until April will cost you $237 dollars based on today’s average credit card interest rate. Please let me know if you are interested in speaking with FICO credit guru Shon Dellinger about these credit saving holiday tips and what else consumers can do this year to assure that their 2011 New Year’s resolution isn’t fixing the damage they did to their credit in 2010. Also, the myFICO Forums can offer your readers helpful tips. Now, I didn’t mind receiving this e-mail because it seems to offer useful information and isn’t directly asking for a sale, although I only gave it a cursory scan because my FICO score is just fine [AJC: and, thank you very much for asking 🙂 ]. What do you think? Is this an automatic delete? If you are not vehemently opposed to it, how would you improve the e-mail? You can tell we have very different market profiles – your spam relates to money and finances, the biggest contribution to my spam folder is pharmacutical products. If you are going to sell something using spam, the things that will create some chance of me responding (positively) are (i) relevant to me (ii) short and to the point (iii) includes something that is free (iv) has an imbedded link to make the reply easy (v) avoids exaggerated claims, logical fallacies and excessive exclamation marks (vi) does not ask for personal information (vii) is well written. Your example is an automatic delete for me – I don’t need credit reports. @ Trainee Investor – ReaLLY???!!!!!!! Do you want to know how to spend this Christmas without damaging your credit score? #2 There should be something to establish Shon Dellinger as an authority on credit worth my time. #4 If they had a positive opinion remind them when you send the follow up sales email. If they DIDN’T have a positive opinion then don’t waste your time sending them a sales email. #5 Offer a discount for a limited number of subscribers and for a limited amount of time. #6 Use any feedback to improve your newsletter and the prospects for getting paid for it. As you mentioned how close to the line is marketing to spamming? Look for example TV ads, we get the same ad played over and over again in each break from the main program, yet this is not consider spamming? Like a quality TV ad that has time and money spent on it, a sales letter to your inbox with good content is not considered spam! To many marketers are typing and praying their offer will be picked up! Not good. @ Aaron – IMHO, the sole purpose of a mailing like this should be to try and have the recipient opt in to a repeat mailing (e.g. newsletter) and use THAT to lead into sales letters. I agree that span has little chance of success- the trick is that well written spam may be say 0.002% effective rather than 0.001% effective. Spam by its nature needs to go to millions to have any chance of making reasonable income. @ Trainee – you are not the target audience. 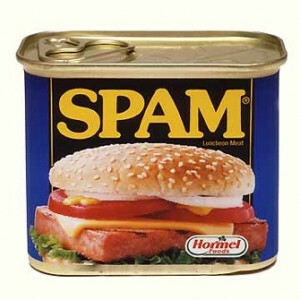 It sound like you delete any and all spam- honestly I do too, I just find it annoying! However, they are people that don’t or no one would still send out spam. I didn’t just make up the tactics I listed – they come from Influence the Psychology of Persuasion. All of categories of tactics have been shown by researchers to improve sales. The book also points out that people believe that they are not affected by such gimmicky tactics, but the research shows that they really are affected. usually delete all spam! except for the odd one, last week one had “free beer” as a subject. welcome to jamaica mon, have a nice day.